It's nice to see books written about my part of the country. Sounds great. Enter me! Any author who can pull off descriptions well is a keeper! Generally I am bored with descriptions, so Mary has my vote. I'd love to read this book. Sounds like a good read! Have a beautiful week, Susan! The setting was a natural part of the story, but did not overshadow it. I think you'd enjoy this book. If you'd like to enter the drawing, you'll need to comment and give me your email. I would love to read this! I lived in Alaska for a few years. It is beautiful! Great review! I absolutely love dropping by, except that I want to buy EVERYTHING you feature. Did I tell you I purchased every work by Tamera Alexander? Well, I did. Now I'm wading through them one-by-one. They make for great pool side enjoyment! LOL! You made my day. I'm sure Tamera Alexander would be thrilled. LOVE descriptive books, especially places I want to go! Plan to buy the book, so don't put me in the drawing. Sounds like a great plot. Please enter me, and I'm a follower. This looks like a great read! Thanks for sharing it. I have a stack of books to get through, but I'll put this one on my reading list. Thanks for stopping by and commenting. I think you'd find this a welcome addition to your reading pile. Welcome to my blog! Thank you for entering the giveaway. Hi Susan, I'd love to enter the drawing. Hi, Jan. You're from Alaska? I'd love to know if you think I got it right. I researched hard for it. And found out it was a diverse state and I needed to really understand my little section of it. I hope I achieved that. Susan, thanks for letting me know you were doing a giveaway. Golden Days is the book that started it all. My first contracted book, although I sold a second book that actually managed to get on the shelves ahead of Golden Days. That was Petticoat Ranch. I just had my 14th book release and they still want more. I write romantic comedy with cowboys. This sounds like a really good book. I would love to read it. I am a new follower on Google. Thanks for commenting and entering the drawing. I received your email with the link. Welcome to my blog, and thank you for becoming a Follower. I post here Monday, Wednesday, and Friday. Thanks for stopping by to say, "hello," to everyone. I loved your book, and I'm sure others will too. I LOVE Mary Connealy! Please enter me in the contest. When Golden Days came out, in a fit of enthusiasm, I bought about one zillion authors copies. 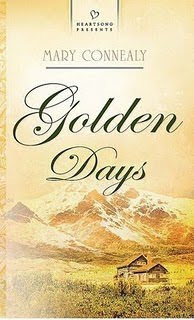 So, even since then, because I think Golden Days is a pretty good example of what I do, historical suspenseful inspirational romantic comedy, I pack two or three books in my carry-on bag when I'm traveling and I give them away. I mean I don't FORCE them on anyone, rather, I sort of try and figure out if they even want their seat-mate on the plane to speak to them. If they don't, I'm totally okay with that. If they do and they're friendly and the conversation progresses to any point at all...I give them a book. Since I'm almost always traveling strictly for writing (because I stay home if I POSSIBLY CAN) I can always say, "I'm in Denver for a writer's conference. Would you like a copy of one of my books? I have a couple of extra ones with me." I figure it's one way to market, plus it's a good conversation starter. I usually include a bookmark which advertises my most recent books. Plus, being on an airplane, they might actually WANT a book to read. LOL! We are a wordy bunch, aren't we? No doubt you have many interesting stories to share from these encounters. The book sounds good, Susan. Thanks for your help and encouragement. gracieprior3(at)gmail(dot)com. I am now a follower Susan. How nice that you respond to every comment! Have a wonderful day! This sounds like a wonderful book and I would love to read it! Everyone have a happy mothers day! At this point, the number of comments are low enough for me to respond personally. I'm all about building relationships. It's makes blogging a joy for me and hopefully for all of you. Welcome, and thanks for entering the drawing. I hope you'll stop by often. We'll have more giveaways to celebrate my 2nd Blogoversary. Welcome to my blog, and thank you for becoming a Follower. In order for you to be entered in the drawing, I need you to leave an email address in the comments. Thanks! I love Mary Connealy's writings. I have two by my beside that I am planning on reading in the next week or so. Such an opportunity, it just had to be shared! Welcome to my blog, and thanks for entering the drawing. You have three entries for this giveaway. Watch for more drawings this month as I celebrate my Happy 2nd Blogoversary. HI! HAPPY MOTHER'S DAY EVERYONE. I had a quiet lunch with my mom today. It was really nice. She's got eight kids. I've got four. Honestly, you'd have thought we'd both be busy. Although, she had at least ONE child (Me, the good one!) with her. But we had a party yesterday for my baby graduating from college, so we were many, many of us together yesterday. So it was a really nice lunch, we got to really visit one on one and talk over the fun from yesterday. I'm glad you had a nice day with your Mom. My Mom and I went out to lunch together after church. Thanks for stopping by. I hope you visit often.